Aperture is one of the parameters of the exposure triangle. Aperture is the diameter of the opening of the diaphragm, through which the light reaches the film or sensor. The higher the aperture, the more light on the sensor. Aperture is measured in fractions of the focal length. For example, with a 100mm focal length, an aperture of 1/16 means that the actual diameter of the diaphragm opening is 100/16 = 6,25mm. While aperture allows to navigate through the exposure triangle, it is not its only function. In fact, each of the parameters of the exposure triangle has a function of its own. Let's first look at the three pictures below, taken at the same exposure but with different apertures (the exposure being compensated by a different shutter speed). The central image was taken at a f/29 aperture, while the two others were taken at a fr/5.6 aperture. 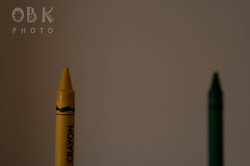 The two crayons are at a different distance from the camera. 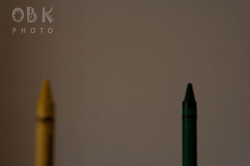 As you can notice, in the middle shot, I was able to get the two crayons in focus, while in the other images, only one of the two was in focus (yellow one on the left image and green one the right image). In fact, when we set the focus on a specific subject (whether manually or via the autofocus), there is a range in front of and behind the subject where the objects will still appear in focus. The width of this range is called Depth Of Field (or DOF). That Depth Of field is directly related to the Aperture. The wider the aperture, the narrower the Depth Of Field. Once again, there is no rule as to what kind of aperture to use. It all depends on the effect that you want to achieve. If you are taking a portrait, it will probably best to have a blurred background, so that you can isolate the face of the subject, and you should then use a wide aperture. If you are shooting a landscape, you might want to have all the scene in focus, so as to see every detail of the scenery. 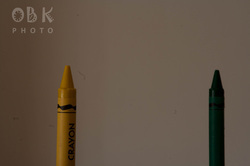 You would then use a narrow aperture to have a wide Depth Of Field.